We are pleased to inform our members and students that ICAI National Helpline has been launched by Chief Guest Hon’ble Union Minister for Railways Shri CA. Suresh Prabhu, during the inaugural session of the International Conference held at Bangalore. ICAI National Helpline is an IVR based facility and is available 24*7 for both members and students. 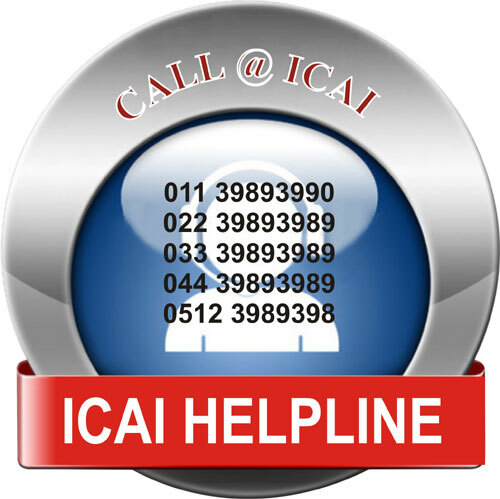 Members or students of ICAI can call any of the given numbers any time as per the convenience. Varied details for members like member status, COP status, Firm status, information of CPE hours, membership fee details etc. and for students details like Article Registration status, article re-registration status etc. are available in the system. In case any specific query is not resolved by through IVR operator assistance is also available during office hours.